Day 364 - The end is near! And HERE’s the latest episode of the Foolish Lego webcomic, episode 145! Are you going to continue posting pictures? I will miss them if you do, but you’ve brought me great joy with what you’ve posted over the last year (or two?). Thank you! Thank you for your support Vicky! I’ll be missing making photographs too, so I will most certainly NOT stop. 🙂 I’m just getting rid of the daily commitment, which was putting me under pressure the last few months. I’ve got a busy job and a few other commitments, which are asking a lot of time lately, I have to go on a two week business trip in January so that would make the daily photo’s practically impossible (at least ones which have at least a little class. Now I hope to take just a little more time to get a picture absolutely right… so I hope things will improve around here. So stay around and check in. I hope to find a new routine shortly. 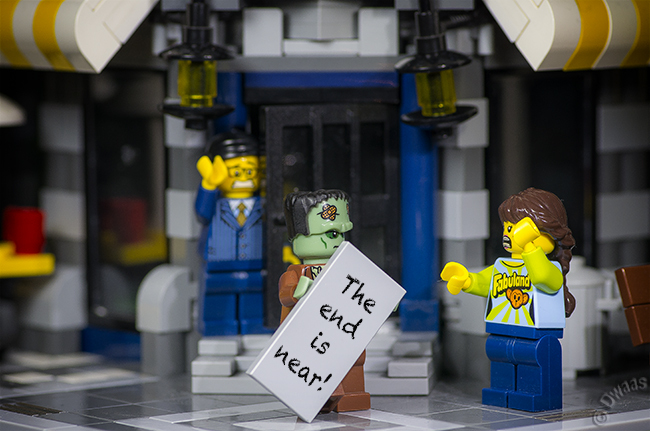 A Frankenstein is walking around with a sign saying “The end is near!” What do you think would happen in real life?